It's great to feel healthy again and feel like entertaining. What better way than to host a birthday dinner party for a dear friend who turns 72 today. The party was the Sunday before -- the only day our schedules allowed us all to be together to celebrate this very special birthday. 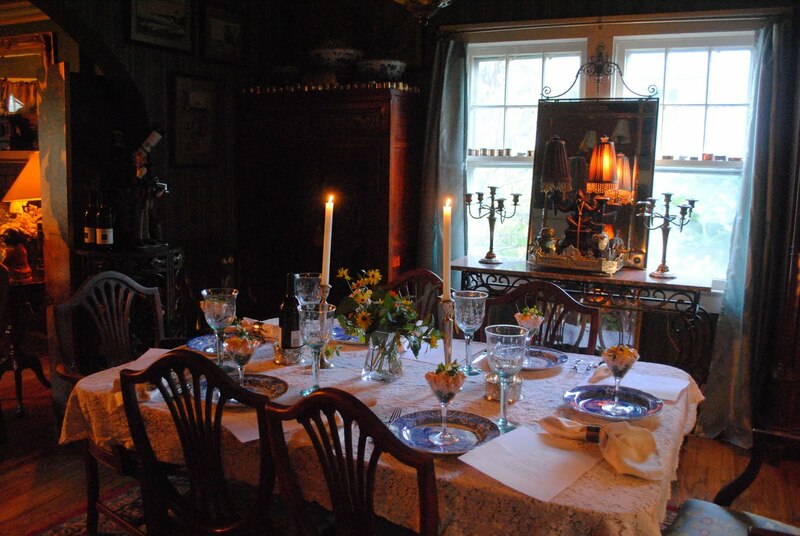 The table for six in the dining room -- with a quaker lace cloth. 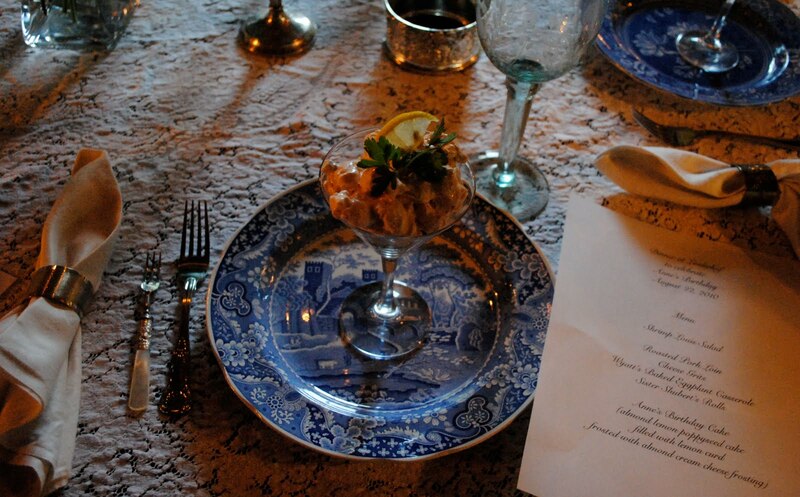 The Spode Blue Room, casual wine glasses, and for the first course, mother of pearl handled forks (which are really dessert forks but I thought they would be great for the Shrimp Louis). And a menu, of course, announcing that this, indeed, was a Birthday dinner! Tapers in silver candlesticks and a vase of the very last flowers blooming in the garden -- the false sunflowers and a couple of sprigs of anise hyssop. The first course, Shrimp Louis -- served over a chiffonade of lettuce in martini glasses and garnished with lemon wedges and parsley. It's easy to make and came from my latest read, Plum Pudding Murder, by Joanne Fluke. It was for a "dip" but I just cut the onions bigger and used whole rock shrimp. It was a perfect first course for a celebratory dinner! Mix the cream cheese and mayonnaise. Add the chili sauce, horseradish and pepper. Mix it up into a smooth sauce. Slice the green onions. Stir them in well. Fold in the shrimp. Add salt if needed. Chill the shrimp louis in a covered bowl in the refrigerator at least 4 hours. 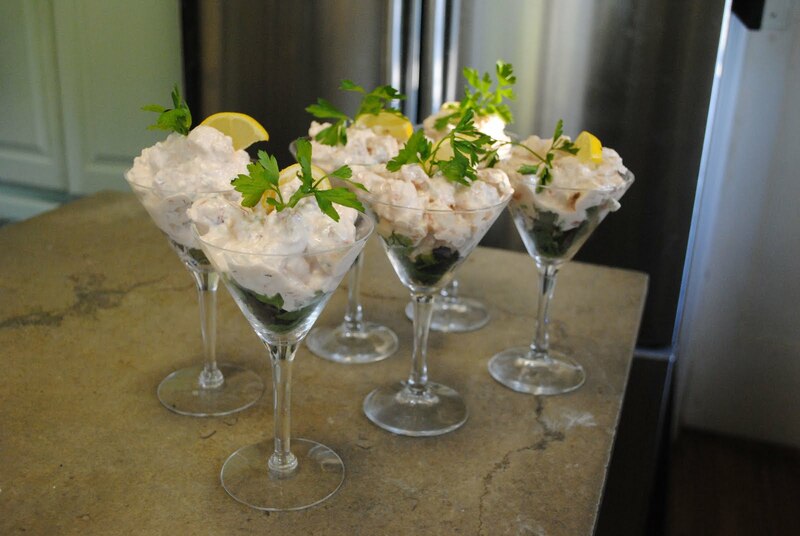 NOTE: If you mince the shrimp and green onions, it makes a great cocktail spread. 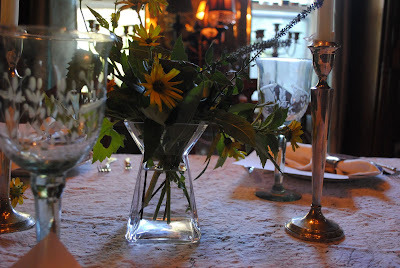 Today is Thursday which means that it's Tablescape Thursday. Please join Susan at Between Naps on the Porch to see the other great tables this Thursday! What a lovely gesture. I've never heard of shrimp louis, but it sounds very good. Thanks for sharing the recipe. What a treat for your dear friend. 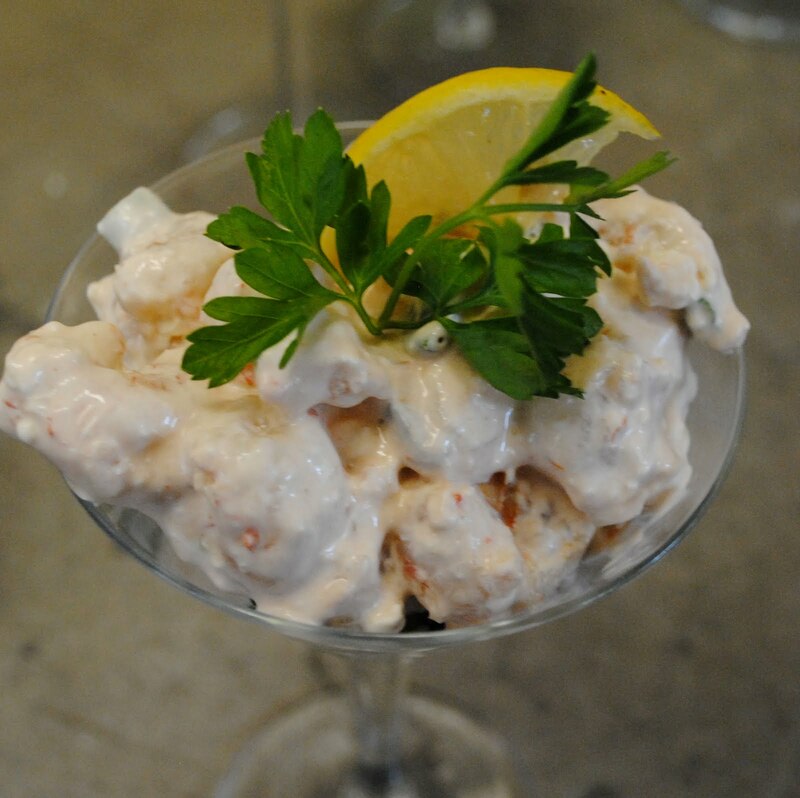 The table looks lovely and the Shrimp Louis is a favorite of ours. It looks very elegant served in the martini glass. Glad you are feeling like entertaining! I would like Shrimp Louis!! I liked the idea ,the shrimp looks. Your table is beautiful.Hugs. So pretty! Nice that you actually have guests to view your tablescapes! So many of us just have pretend guests! I'm off to Southold after a late morning doc's appointment; Howard's out getting a haircut so his first day on the new job, he doesn't look newly shorn like a Kindergartner beginning school. Yes, Dion loves to come to the beach house. he gets to bark at his arch enemy, the Cairn terrier who lives next door and barks down at HIM from their second floor deck. Dion is right when he claims that the other guy always starts it. I don't think I'm going to cook at all this weekend! Well, maybe just a little. . .
Love the table in this post; it's just right. I really envy you the Spode! Howard's sister has lots of Spode too -- but I have nary a plate! I'm bringing my yard sale and thrift shop hunting sense with me this weekend. It's good hunting out there! Martha, what a beautiful birthday dinner! The table setting looks wonderful. A special day indeed! I hope you all enjoyed it very much!! That sound wonderful!! Would love to make this! Table is so pretty too. How pretty, and how nice of you! Some news: We're staring a Giveaway Friday! link-up party this Fri. 8/27 plus we are giving away custom backsplash! Hope you'll join us. Just a beautiful post as always!! Hugs from St. Louis! What a wonderful dinner! I am sure she was delighted! Beautiful table, and that Shrimp Louis looks (and the recipe sounds) fabulous! What a festive presentation, perfect for a birthday celebration!